It washes, brushes and dries a 50 cm path moving forward. The Santoemma Elite is a very quiet machine working at only 60 dB. It is possible to adjust the brush and vacuum head pressure, according to the type of carpet. The water-flow can be regulated, for a maintenance low-moisture cleaning or a restoration deep-cleaning. 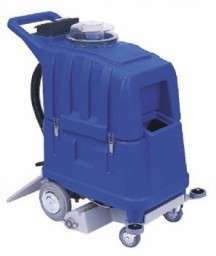 Optional squeegee SQ720E allows the Elite to clean hard floor. Main application fields: cleaning companies, hotels, conference halls, offices, banks, cinemas, theatres, shops, ferry boats, ships, airports, fitness centres, school, universities, shopping centres and all places with large surfaces of carpet.